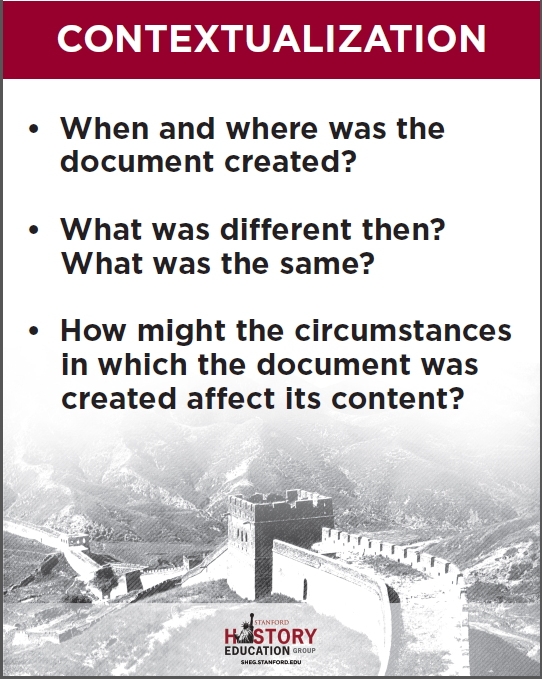 "[Reading Like A Historian] teaches students how to investigate historical questions by employing reading strategies such as sourcing, contextualizing, corroborating, and close reading. 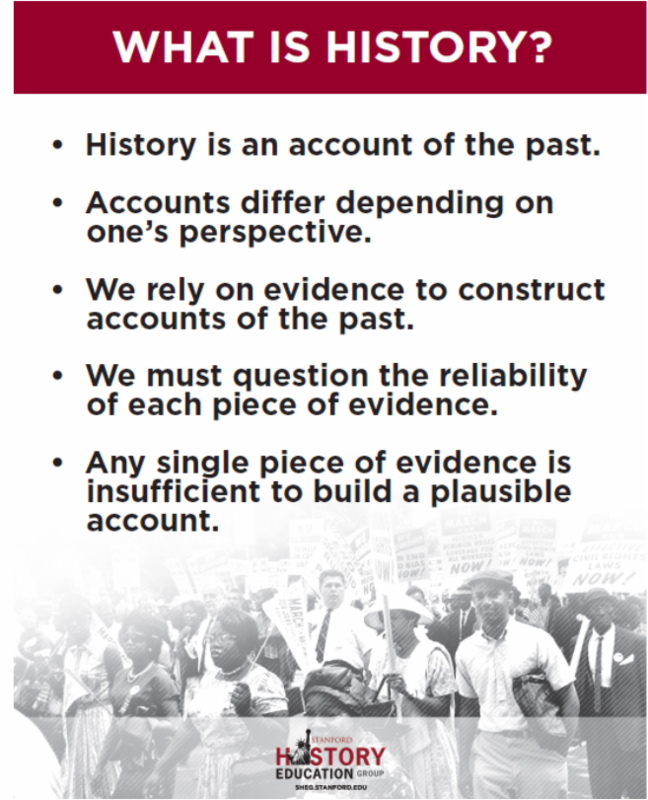 Instead of memorizing historical facts, students evaluate the trustworthiness of multiple perspectives on historical issues. 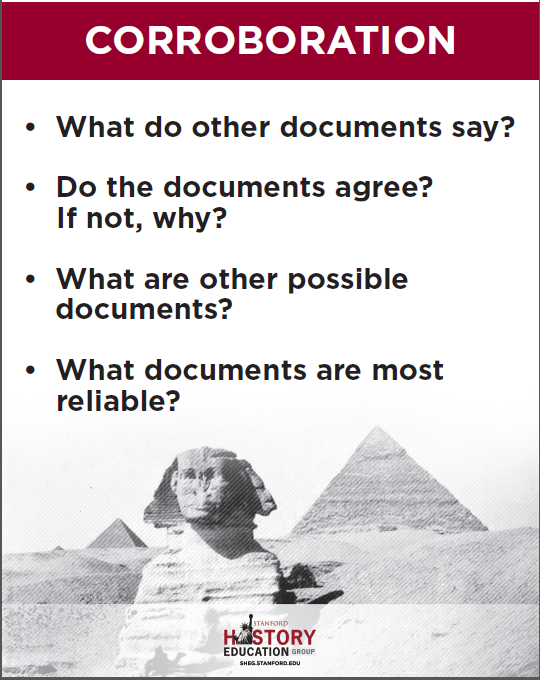 They learn to make historical claims backed by documentary evidence." When we did the first Lunchroom Fight activity, we focused on sourcing. reliable or trustworthy than others. together to fill out the story of what happened in the lunchroom that day. of context in the correct part of the first column of the handout. additional pieces of context for each of the areas of context. Discuss answers as a class. and third columns and complete the suspension report independently. one account more trustworthy than another? three. Have them complete worksheet. 3. Discussion: Review student answers as a class. Source 1: Hollywood movie about the American Revolution made 2001. American Revolution, published in 1999. Which do you trust more? Why? 2. Historical Question: What was slavery like in South Carolina? man collecting oral histories for the Federal Writers’ Project. woman collecting oral histories for the Federal Writers’ Project. Source 1: Interview with 80 year-old Holocaust survivor in 1985. Source 2: Map of concentration camp found in Nazi files. Source 1: Government film explaining internment from 1942. Source 2: Speech by American General touring the United States in 1969. 6. Historical Question: What happened at the Battle of Little Bighorn? Source 1: High school history textbook from 1985. Source 2: Newspaper account from the day after the battle in June 1876.
comparing pieces of evidence and seeing where they agree and disagree. you risk that it might be incomplete or maybe even wrong. consider other explanations or interpretations. convincing when two people who usually disagree happen to agree. because both sides agree on that point. 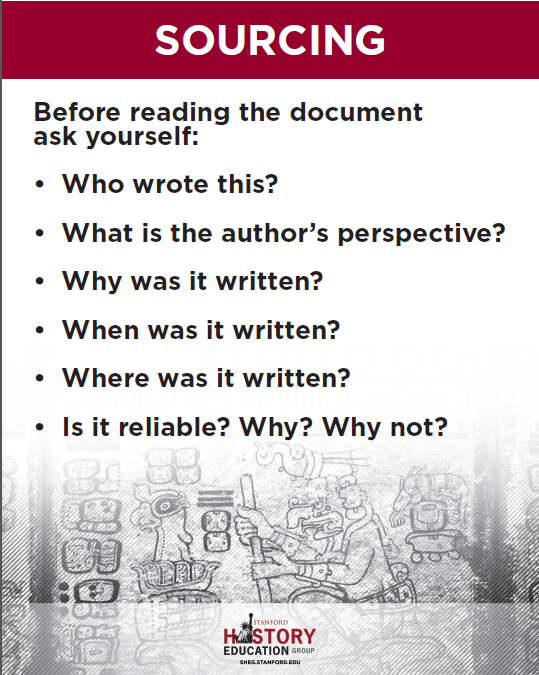 We’re going to practice corroboration today with two examples.